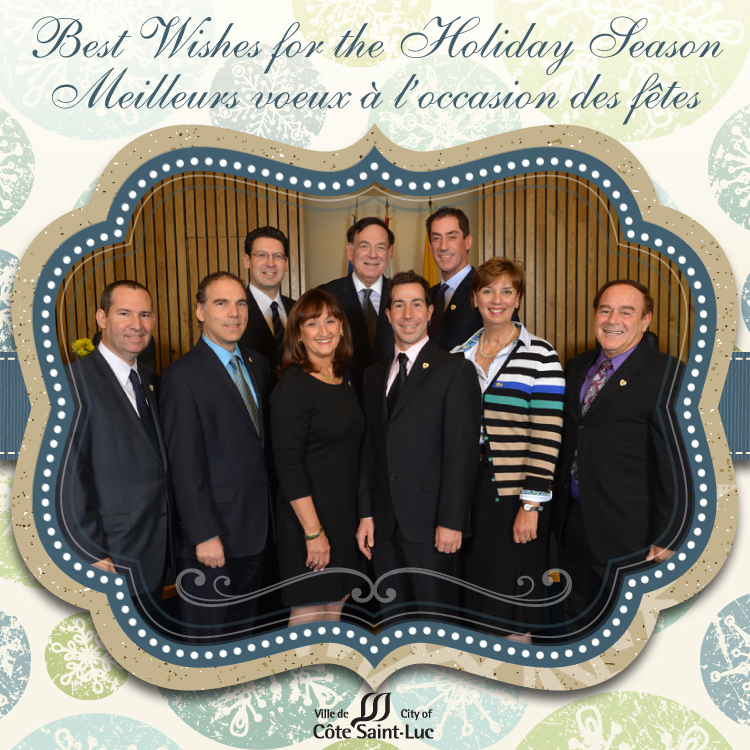 The holiday season is a beautiful time throughout Cote Saint-Luc. The early sunset, crisp air and blanket of white help to amplify the beauty of the colourful lights that adorn many homes be they Christmas decorations, Chanukah Menorahs or other displays. It has also become a time to welcome the parishioners from St. Richard’s Church to City Hall to sing a few songs and to light the city’s Christmas Tree. Father Peter always has inspirational words that carry a message of love and goodwill far and wide across our wonderful city to residents of all backgrounds. In this spirit, I wish all residents of CSL, friends and family, the very best of that which is symbolic of the Christmas Tree. May the bright lights illuminate your homes and lives. May the branches in your family be of beauty. And may the beauty green teach us that hope and love will ever be the way to joy and peace. 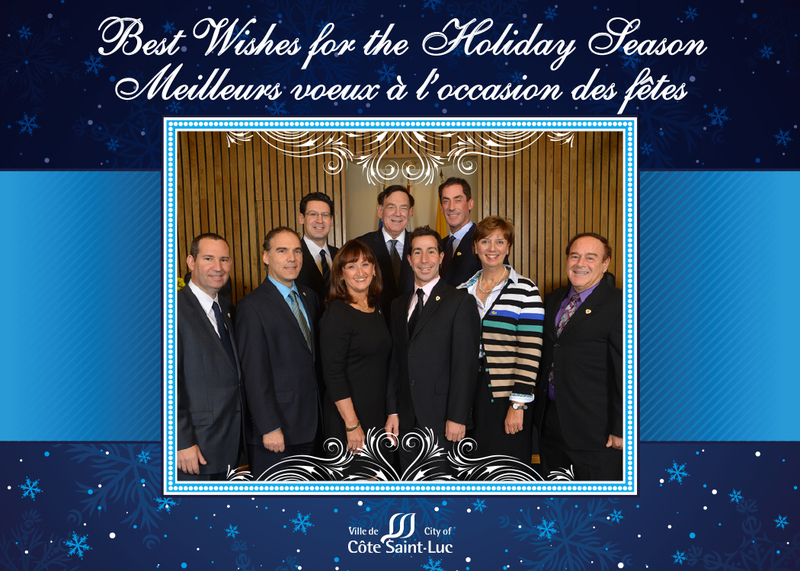 As Acting Mayor of Cote Saint-Luc it gives me great pleasure to extend greetings and best wishes for good health and great happiness to our residents. Have a safe and enjoyable holiday. And Happy New Year! En tant que maire par intérim de Côte Saint-Luc il me fait grand plaisir de vous saluer et d’exprimer mes meilleurs voeux pour la bonne santé et beaucoup de bonheur à tous nos résidents. Bonne année! Wishing you and your family good health and much happiness at this special time and throughout the New Year. Tonight begins the Eight-Day Festival of Chanukah. The holiday is celebrated in Jewish homes and communities around the globe. We celebrate light over darkness, freedom over oppression and peace for the Jewish People, Israel and all mankind. Hanoucca marque une importante victoire militaire des Maccabées et symbolise la résistance spirituelle du judaïsme à l’assimilation grecque. Selon la tradition rabbinique, au cours de cette consécration se produit le miracle de la fiole d’huile, permettant aux prêtres du Temple de faire brûler pendant huit jours une quantité d’huile à peine suffisante pour une journée. From my family at City Hall, and my real one at home, we wish you and yours a very happy holiday. Je vous souhaite les meilleurs voeux pour le Hanoucca sameach.